Hardware Vsync event occurs on an OS specific Hardware Vsync Thread on a per monitor basis. The Hardware Vsync Thread attached to the monitor notifies the CompositorVsyncDispatchers and RefreshTimerVsyncDispatcher. For every Firefox window on the specific monitor, notify a CompositorVsyncDispatcher. The CompositorVsyncDispatcher is specific to one window. The CompositorVsyncDispatcher notifies a CompositorWidgetVsyncObserver when remote compositing, or a CompositorVsyncScheduler::Observer when compositing in-process. If remote compositing, a vsync notification is sent from the CompositorWidgetVsyncObserver to the VsyncBridgeChild on the UI process, which sends an IPDL message to the VsyncBridgeParent on the compositor thread of the GPU process, which then dispatches to CompositorVsyncScheduler::Observer. The RefreshTimerVsyncDispatcher notifies the Chrome RefreshTimer that a vsync has occurred. The RefreshTimerVsyncDispatcher sends IPC messages to all content processes to tick their respective active RefreshTimer. The Compositor dispatches input events on the Compositor Thread, then composites. Input events are only dispatched on the Compositor Thread on b2g. The RefreshDriver paints on the Main Thread. Hardware vsync events from (1), occur on a specific Display Object. The Display object is responsible for enabling / disabling vsync on a per connected display basis. For example, if two monitors are connected, two Display objects will be created, each listening to vsync events for their respective displays. We require one Display object per monitor as each monitor may have different vsync rates. As a fallback solution, we have one global Display object that can synchronize across all connected displays. The global Display is useful if a window is positioned halfway between the two monitors. Each platform will have to implement a specific Display object to hook and listen to vsync events. As of this writing, both Firefox OS and OS X create their own hardware specific Hardware Vsync Thread that executes after a vsync has occurred. OS X creates one Hardware Vsync Thread per CVDisplayLinkRef. We do not currently support multiple displays, so we use one global CVDisplayLinkRef that works across all active displays. On Windows, we have to create a new platform thread that waits for DwmFlush(), which works across all active displays. Once the thread wakes up from DwmFlush(), the actual vsync timestamp is retrieved from DwmGetCompositionTimingInfo(), which is the timestamp that is actually passed into the compositor and refresh driver. When a vsync occurs on a Display, the Hardware Vsync Thread callback fetches all CompositorVsyncDispatchers associated with the Display. Each CompositorVsyncDispatcher is notified that a vsync has occurred with the vsync’s timestamp. It is the responsibility of the CompositorVsyncDispatcher to notify the Compositor that is awaiting vsync notifications. The Display will then notify the associated RefreshTimerVsyncDispatcher, which should notify all active RefreshDrivers to tick. All Display objects are encapsulated in a VsyncSource object. The VsyncSource object lives in gfxPlatform and is instantiated only on the parent process when gfxPlatform is created. The VsyncSource is destroyed when gfxPlatform is destroyed. It can also be destroyed when the layout frame rate pref (or other prefs that influence frame rate) are changed. This may mean we switch from hardware to software vsync (or vice versa) at runtime. During the switch, there may briefly be 2 vsync sources. Otherwise, there is only one VsyncSource object throughout the entire lifetime of Firefox. Each platform is expected to implement their own VsyncSource to manage vsync events. On OS X, this is through CVDisplayLinkRef. On Windows, it should be through DwmGetCompositionTimingInfo. When the CompositorVsyncDispatcher is notified of the vsync event, the CompositorVsyncScheduler::Observer associated with the CompositorVsyncDispatcher begins execution. Since the CompositorVsyncDispatcher executes on the Hardware Vsync Thread and the Compositor composites on the CompositorThread, the CompositorVsyncScheduler::Observer posts a task to the CompositorThread. The CompositorBridgeParent then composites. The model where the CompositorVsyncDispatcher notifies components on the Hardware Vsync Thread, and the component schedules the task on the appropriate thread is used everywhere. The CompositorVsyncScheduler::Observer listens to vsync events as needed and stops listening to vsync when composites are no longer scheduled or required. Every CompositorBridgeParent is associated and tied to one CompositorVsyncScheduler::Observer, which is associated with the CompositorVsyncDispatcher. Each CompositorBridgeParent is associated with one widget and is created when a new platform window or nsBaseWidget is created. The CompositorBridgeParent, CompositorVsyncDispatcher, CompositorVsyncScheduler::Observer, and nsBaseWidget all have the same lifetimes, which are created and destroyed together. When compositing out-of-process, this model changes slightly. In this case there are effectively two observers: a UI process observer (CompositorWidgetVsyncObserver), and the CompositorVsyncScheduler::Observer in the GPU process. There are also two dispatchers: the widget dispatcher in the UI process (CompositorVsyncDispatcher), and the IPDL-based dispatcher in the GPU process (CompositorBridgeParent::NotifyVsync). The UI process observer and the GPU process dispatcher are linked via an IPDL protocol called PVsyncBridge. PVsyncBridge is a top-level protocol for sending vsync notifications to the compositor thread in the GPU process. The compositor controls vsync observation through a separate actor, PCompositorWidget, which (as a subactor for CompositorBridgeChild) links the compositor thread in the GPU process to the main thread in the UI process. Out-of-process compositors do not go through CompositorVsyncDispatcher directly. Instead, the CompositorWidgetDelegate in the UI process creates one, and gives it a CompositorWidgetVsyncObserver. This observer forwards notifications to a Vsync I/O thread, where VsyncBridgeChild then forwards the notification again to the compositor thread in the GPU process. The notification is received by a VsyncBridgeParent. The GPU process uses the layers ID in the notification to find the correct compositor to dispatch the notification to. The CompositorVsyncDispatcher executes on the Hardware Vsync Thread. It contains references to the nsBaseWidget it is associated with and has a lifetime equal to the nsBaseWidget. The CompositorVsyncDispatcher is responsible for notifying the CompositorBridgeParent that a vsync event has occurred. There can be multiple CompositorVsyncDispatchers per Display, one CompositorVsyncDispatcher per window. The only responsibility of the CompositorVsyncDispatcher is to notify components when a vsync event has occurred, and to stop listening to vsync when no components require vsync events. We require one CompositorVsyncDispatcher per window so that we can handle multiple Displays. When compositing in-process, the CompositorVsyncDispatcher is attached to the CompositorWidget for the window. When out-of-process, it is attached to the CompositorWidgetDelegate, which forwards observer notifications over IPDL. In the latter case, its lifetime is tied to a CompositorSession rather than the nsIWidget. The VsyncSource has an API to switch a CompositorVsyncDispatcher from one Display to another Display. For example, when one window either goes into full screen mode or moves from one connected monitor to another. When one window moves to another monitor, we expect a platform specific notification to occur. The detection of when a window enters full screen mode or moves is not covered by Silk itself, but the framework is built to support this use case. The expected flow is that the OS notification occurs on nsIWidget, which retrieves the associated CompositorVsyncDispatcher. The CompositorVsyncDispatcher then notifies the VsyncSource to switch to the correct Display the CompositorVsyncDispatcher is connected to. Because the notification works through the nsIWidget, the actual switching of the CompositorVsyncDispatcher to the correct Display should occur on the Main Thread. The current implementation of Silk does not handle this case and needs to be built out. The CompositorVsyncScheduler::Observer handles the vsync notifications and interactions with the CompositorVsyncDispatcher. When the Compositor requires a scheduled composite, it notifies the CompositorVsyncScheduler::Observer that it needs to listen to vsync. The CompositorVsyncScheduler::Observer then observes / unobserves vsync as needed from the CompositorVsyncDispatcher to enable composites. The GeckoTouchDispatcher is a singleton that resamples touch events to smooth out jank while tracking a user’s finger. Because input and composite are linked together, the CompositorVsyncScheduler::Observer has a reference to the GeckoTouchDispatcher and vice versa. One large goal of Silk is to align touch events with vsync events. On Firefox OS, touchscreens often have different touch scan rates than the display refreshes. A Flame device has a touch refresh rate of 75 HZ, while a Nexus 4 has a touch refresh rate of 100 HZ, while the device’s display refresh rate is 60HZ. When a vsync event occurs, we resample touch events, and then dispatch the resampled touch event to APZ. Touch events on Firefox OS occur on a Touch Input Thread whereas they are processed by APZ on the APZ Controller Thread. We use Google Android’s touch resampling algorithm to resample touch events. Currently, we have a strict ordering between Composites and touch events. When a touch event occurs on the Touch Input Thread, we store the touch event in a queue. When a vsync event occurs, the CompositorVsyncDispatcher notifies the Compositor of a vsync event, which notifies the GeckoTouchDispatcher. The GeckoTouchDispatcher processes the touch event first on the APZ Controller Thread, which is the same as the Compositor Thread on b2g, then the Compositor finishes compositing. We require this strict ordering because if a vsync notification is dispatched to both the Compositor and GeckoTouchDispatcher at the same time, a race condition occurs between processing the touch event and therefore position versus compositing. In practice, this creates very janky scrolling. As of this writing, we have not analyzed input events on desktop platforms. One slight quirk is that input events can start a composite, for example during a scroll and after the Compositor is no longer listening to vsync events. In these cases, we notify the Compositor to observe vsync so that it dispatches touch events. If touch events were not dispatched, and since the Compositor is not listening to vsync events, the touch events would never be dispatched. The GeckoTouchDispatcher handles this case by always forcing the Compositor to listen to vsync events while touch events are occurring. When the nsBaseWidget shuts down - It calls nsBaseWidget::DestroyCompositor on the Gecko Main Thread. During nsBaseWidget::DestroyCompositor, it first destroys the CompositorBridgeChild. CompositorBridgeChild sends a sync IPC call to CompositorBridgeParent::RecvStop, which calls CompositorBridgeParent::Destroy. During this time, the main thread is blocked on the parent process. CompositorBridgeParent::RecvStop runs on the Compositor thread and cleans up some resources, including setting the CompositorVsyncScheduler::Observer to nullptr. CompositorBridgeParent::RecvStop also explicitly keeps the CompositorBridgeParent alive and posts another task to run CompositorBridgeParent::DeferredDestroy on the Compositor loop so that all ipdl code can finish executing. The CompositorVsyncScheduler::Observer also unobserves from vsync and cancels any pending composite tasks. Once CompositorBridgeParent::RecvStop finishes, the main thread in the parent process continues shutting down the nsBaseWidget. At the same time, the Compositor thread is executing tasks until CompositorBridgeParent::DeferredDestroy runs, which flushes the compositor message loop. Now we have two tasks as both the nsBaseWidget releases a reference to the Compositor on the main thread during destruction and the CompositorBridgeParent::DeferredDestroy releases a reference to the CompositorBridgeParent on the Compositor Thread. Finally, the CompositorBridgeParent itself is destroyed on the main thread once both references are gone due to explicit main thread destruction. With the CompositorVsyncScheduler::Observer, any accesses to the widget after nsBaseWidget::DestroyCompositor executes are invalid. Any accesses to the compositor between the time the nsBaseWidget::DestroyCompositor runs and the CompositorVsyncScheduler::Observer’s destructor runs aren’t safe yet a hardware vsync event could occur between these times. Since any tasks posted on the Compositor loop after CompositorBridgeParent::DeferredDestroy is posted are invalid, we make sure that no vsync tasks can be posted once CompositorBridgeParent::RecvStop executes and DeferredDestroy is posted on the Compositor thread. When the sync call to CompositorBridgeParent::RecvStop executes, we explicitly set the CompositorVsyncScheduler::Observer to null to prevent vsync notifications from occurring. 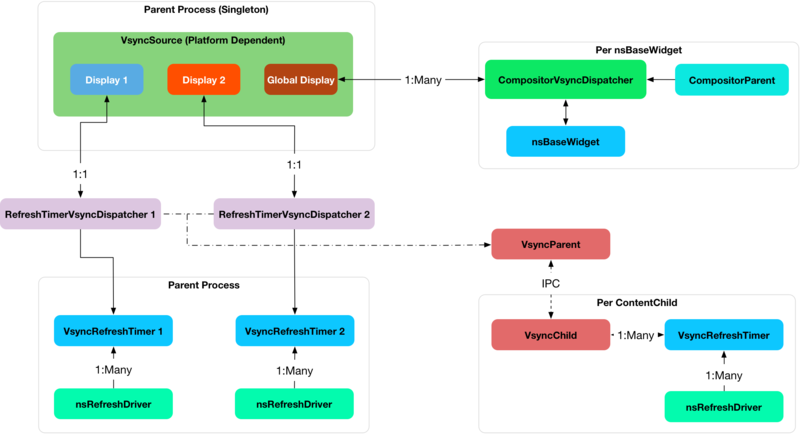 If vsync notifications were allowed to occur, since the CompositorVsyncScheduler::Observer’s vsync notification executes on the hardware vsync thread, it would post a task to the Compositor loop and may execute after CompositorBridgeParent::DeferredDestroy. Thus, we explicitly shut down vsync events in the CompositorVsyncDispatcher and CompositorVsyncScheduler::Observer during nsBaseWidget::Shutdown to prevent any vsync tasks from executing after CompositorBridgeParent::DeferredDestroy. The CompositorVsyncDispatcher may be destroyed on either the main thread or Compositor Thread, since both the nsBaseWidget and CompositorVsyncScheduler::Observer race to destroy on different threads. nsBaseWidget is destroyed on the main thread and releases a reference to the CompositorVsyncDispatcher during destruction. The CompositorVsyncScheduler::Observer has a race to be destroyed either during CompositorBridgeParent shutdown or from the GeckoTouchDispatcher which is destroyed on the main thread with ClearOnShutdown. Whichever object, the CompositorBridgeParent or the GeckoTouchDispatcher is destroyed last will hold the last reference to the CompositorVsyncDispatcher, which destroys the object. The Refresh Driver is ticked from a single active timer. The assumption is that there are multiple RefreshDrivers connected to a single RefreshTimer. There are two RefreshTimers: an active and an inactive RefreshTimer. Each Tab has its own RefreshDriver, which connects to one of the global RefreshTimers. The RefreshTimers execute on the Main Thread and tick their connected RefreshDrivers. We do not want to break this model of multiple RefreshDrivers per a set of two global RefreshTimers. Each RefreshDriver switches between the active and inactive RefreshTimer. Instead, we create a new RefreshTimer, the VsyncRefreshTimer which ticks based on vsync messages. We replace the current active timer with a VsyncRefreshTimer. All tabs will then tick based on this new active timer. Since the RefreshTimer has a lifetime of the process, we only need to create a single RefreshTimerVsyncDispatcher per Display when Firefox starts. Even if we do not have any content processes, the Chrome process will still need a VsyncRefreshTimer, thus we can associate the RefreshTimerVsyncDispatcher with each Display. When Firefox starts, we initially create a new VsyncRefreshTimer in the Chrome process. The VsyncRefreshTimer will listen to vsync notifications from RefreshTimerVsyncDispatcher on the global Display. When nsRefreshDriver::Shutdown executes, it will delete the VsyncRefreshTimer. This creates a problem as all the RefreshTimers are currently manually memory managed whereas VsyncObservers are ref counted. To work around this problem, we create a new RefreshDriverVsyncObserver as an inner class to VsyncRefreshTimer, which actually receives vsync notifications. It then ticks the RefreshDrivers inside VsyncRefreshTimer. With Content processes, the start up process is more complicated. We send vsync IPC messages via the use of the PBackground thread on the parent process, which allows us to send messages from the Parent process’ without waiting on the main thread. This sends messages from the Parent::PBackground Thread to the Child::Main Thread. The main thread receiving IPC messages on the content process is acceptable because RefreshDrivers must execute on the main thread. However, there is some amount of time required to setup the IPC connection upon process creation and during this time, the RefreshDrivers must tick to set up the process. To get around this, we initially use software RefreshTimers that already exist during content process startup and swap in the VsyncRefreshTimer once the IPC connection is created. During nsRefreshDriver::ChooseTimer, we create an async PBackground IPC open request to create a VsyncParent and VsyncChild. At the same time, we create a software RefreshTimer and tick the RefreshDrivers as normal. Once the PBackground callback is executed and an IPC connection exists, we swap all RefreshDrivers currently associated with the active RefreshTimer and swap the RefreshDrivers to use the VsyncRefreshTimer. Since all interactions on the content process occur on the main thread, there are no need for locks. The VsyncParent listens to vsync events through the VsyncRefreshTimerDispatcher on the parent side and sends vsync IPC messages to the VsyncChild. The VsyncChild notifies the VsyncRefreshTimer on the content process. During the shutdown process of the content process, ActorDestroy is called on the VsyncChild and VsyncParent due to the normal PBackground shutdown process. Once ActorDestroy is called, no IPC messages should be sent across the channel. After ActorDestroy is called, the IPDL machinery will delete the VsyncParent/Child pair. The VsyncParent, due to being a VsyncObserver, is ref counted. After VsyncParent::ActorDestroy is called, it unregisters itself from the RefreshTimerVsyncDispatcher, which holds the last reference to the VsyncParent, and the object will be deleted. VsyncSource::Display::RefreshTimerVsyncDispatcher receives a Vsync notification from the OS in the parent process. RefreshTimerVsyncDispatcher notifies VsyncRefreshTimer::RefreshDriverVsyncObserver that a vsync occurred on the parent process on the hardware vsync thread. RefreshTimerVsyncDispatcher notifies the VsyncParent on the hardware vsync thread that a vsync occurred. The VsyncRefreshTimer::RefreshDriverVsyncObserver in the parent process posts a task to the main thread that ticks the refresh drivers. VsyncParent posts a task to the PBackground thread to send a vsync IPC message to VsyncChild. VsyncChild receive a vsync notification on the content process on the main thread and ticks their respective RefreshDrivers. On the parent process, newer vsync messages update a vsync timestamp but do not actually queue any tasks on the main thread. Once the parent process’ main thread executes the refresh driver tick, it uses the most updated vsync timestamp to tick the refresh driver. After the refresh driver has ticked, one single vsync message is queued for another refresh driver tick task. On the content process, the IPDL compress keyword automatically compresses IPC messages. In order to have multiple monitor support for the RefreshDrivers, we have multiple active RefreshTimers. Each RefreshTimer is associated with a specific Display via an id and tick when it’s respective Display vsync occurs. We have N RefreshTimers, where N is the number of connected displays. Each RefreshTimer still has multiple RefreshDrivers. When a tab or window changes monitors, the nsIWidget receives a display changed notification. Based on which display the window is on, the window switches to the correct RefreshTimerVsyncDispatcher and CompositorVsyncDispatcher on the parent process based on the display id. Each TabParent should also send a notification to their child. Each TabChild, given the display ID, switches to the correct RefreshTimer associated with the display ID. When each display vsync occurs, it sends one IPC message to notify vsync. The vsync message contains a display ID, to tick the appropriate RefreshTimer on the content process. There is still only one VsyncParent/VsyncChild pair, just each vsync notification will include a display ID, which maps to the correct RefreshTimer. CompositorVsyncScheduler::Observer - Lives and dies the same time as the CompositorBridgeParent. RefreshTimerVsyncDispatcher - As long as the associated display object, which is the lifetime of Firefox. VsyncSource - Lives as long as the gfxPlatform on the chrome process, which is the lifetime of Firefox. All VsyncObservers are notified on the Hardware Vsync Thread. It is the responsibility of the VsyncObservers to post tasks to their respective correct thread. For example, the CompositorVsyncScheduler::Observer will be notified on the Hardware Vsync Thread, and post a task to the Compositor Thread to do the actual composition. Main Thread - PVsyncChild receives IPC messages on the main thread. We also enable/disable vsync on the main thread. PBackground Thread - Creates a connection from the PBackground thread on the parent process to the main thread in the content process. Hardware Vsync Thread - Every platform is different, but we always have the concept of a hardware vsync thread. Sometimes this is actually created by the host OS. On Windows, we have to create a separate platform thread that blocks on DwmFlush().